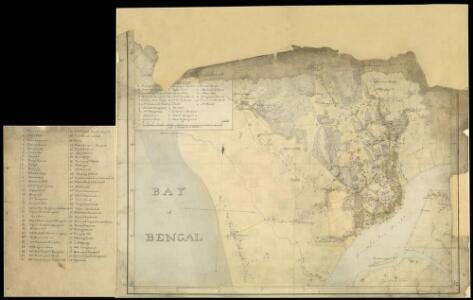 Description: Pen-and-ink and water-colour fragment of a map of Chittagong by John Cheape(1792-1875) in 1818. Chittagong, located in Bangladesh at the point where the Karnaphuli River empties into the Bay of Bengal, is a significant port and has been used for centuries by Arakanese, Arab, Persian, Portuguese and Mughal sailors. Under the Portuguese in the 16th century the town was known as Porto Grande and became an important trading centre. It was captured by the Nawab of Bengal in 1666 and fell to the East India Company in 1760; 60 years later it was claimed by the emperor of Burma (now known as Myanmar) and this led to conflict between Burma and the United Kingdom in 1824. After Independence in 1947 Chittagong was part of East Pakistan but became part of the new nation of Bangladesh in 1971. Today Chittagong is the second largest city in Bangladesh, an important commercial centre and the site of a steel mill and oil refinery.